When the aspect’s orb permits it to be made across the line of a sign, as illustrated in Elbert Hubbard’s case by the sun (near the end of a common sign) square Jupiter (near the beginning of a cardinal sign), the planets here are in sextile aspect and so quadrature support is not necessary, if anything they must be out of quadrature. Looking at the square between the Sun and Neptune in the chart of Elbert Hubbard, we see immediately that it is out of quadrature and should be disregarded. Only a square within the same quadrature should be examined. That is true of trines, oppositions, and conjunctions as well. Knowledge of this will spare the student many embarrassing mistakes in the horoscopes where the cusps of the houses might make the planets seem to be in a relation quite different from their actual situation. Hattie’s preponderance in the 12th makes sense, as it rules “hidden issues” and hospital scenes. 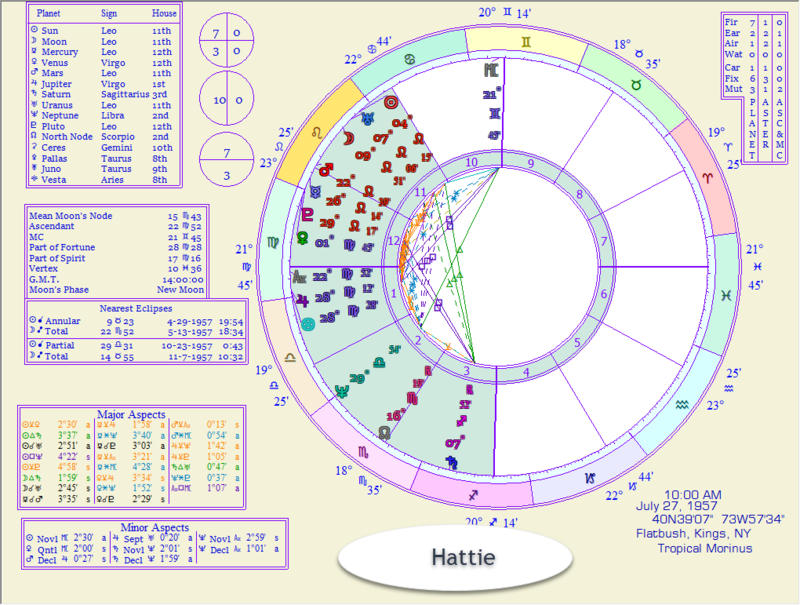 Typically because Pisces is the essential ruler it covers feet and toes, but in Hattie’s case the chart is almost reversed and Venus is in the opposite opposite of Virgo and so rules “teeth.” Hattie is a dental surgeon and so it is true that her work is similar to “mining” and exploration. She also have a preponderance in Leo, showing that she works best where is she is in charge — she have 5 planets in Leo spanning from the eleventh to the twelfth houses. Her temperament type is a Bundle as her planets all fall within one trine of the circle.